The second semester core studio focuses on the construction and fabrication of a flying machine. A process of hybridization serves as the impetus for each student’s project, where the performative aspects of form and material are investigated through various assembly techniques. Design of the flying machines is resolved not through the manipulation of a single surface or material, but through tectonic interactions and systems assembly, which require multiple joints, surfaces, and materials. Throughout the course of the semester, students will work iteratively, employing both analog and digital design techniques, to produce prototypes that will be evaluated for performative and aesthetic criteria. Students will be expected to engage in thorough analysis, thoughtful development of ideas, and rigorous testing and observation of their studio project with a high level of craft and resolution. This semester also serves as time to create and develop a formal understanding of the myths and heroic acts of making and designing in the contemporary world. The students begin with a mechanical flying precedent and a living precedent that moves through a fluid medium (air or water). The students build models and make drawings to study the relationship between form and performance. This series is also the first foray for these students into computer-aided drawing. First year undergraduate student Claude Luo chose a delta kite and a hammerhead shark. The next step is to develop a flying machine prototype that expands on what the students have learned from their precedents. Claude Luo chose to study the wing form of the shark's head, and the controlled movement of a spine. Claude's second prototype continued to study the structure and joints of a spine, but also began to explore the extension of surfaces to keep the machine in flight. 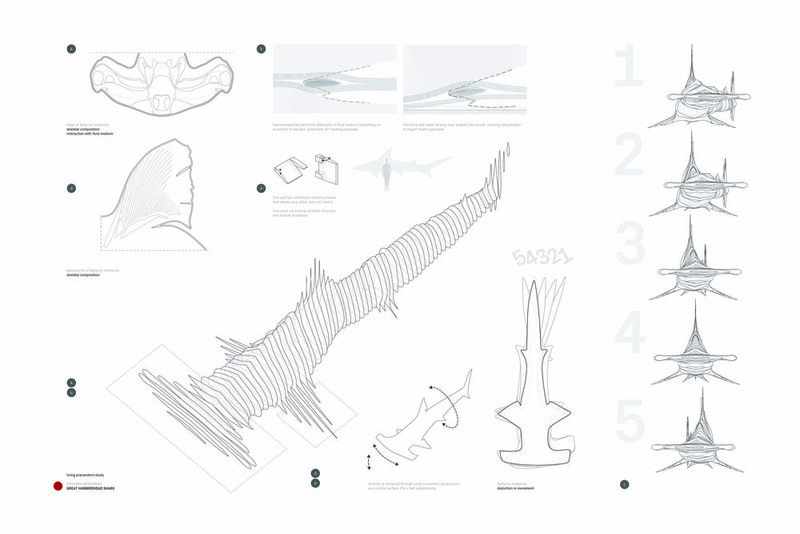 Claude's final prototype combines the hammerhead form and the body of the shark, while integrating all knowledge gained about constructing controlled spine movement.